On a back road between my house and Ogunquit, Maine there is a place where the Ogunquit River crosses under the road on its way to the ocean. The river is still and dark in this one spot. Beavers built a dam here so the river is slowed down enough that water lilies are growing in profusion. Water lilies are sweet, mysterious flowers. They hold their proud heads up above the river’s surface on sturdy strong stems. I saw the lilies just starting to bloom a week ago. I decided on the size and shape of the painting before I even went on location to paint it. The river has changed so much since the beavers moved in. It still has a strong current but it isn’t noticeable in this one area. Along the banks where the current is very slow the water lilies cluster and grow in profusion. In an area that once looked more like a meadow all kinds of water loving plants have taken root. Shrubs and thick bushy plants now fill the open space. 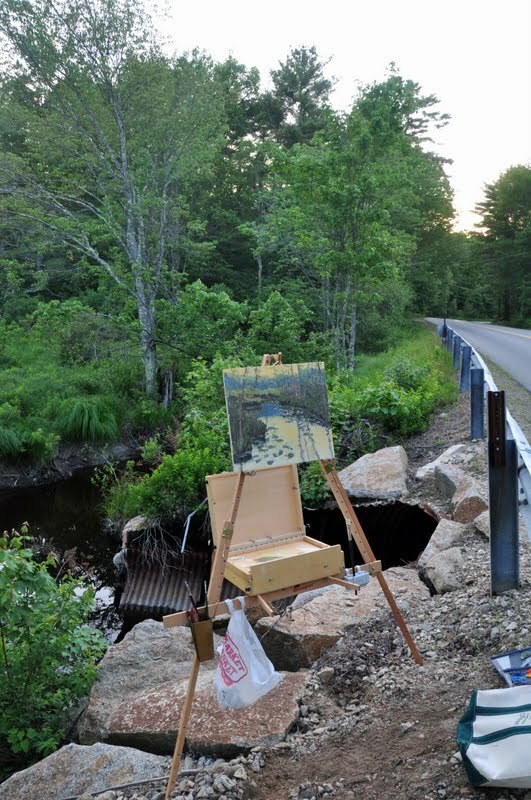 The only spot available to set up to paint the view was right above a culvert on the very edge of the water. This isn’t a problem for my Gloucester easel which is sturdy and stable. I started painting around 5:00 PM. I wanted very little direct sunlight and muted colors for this painting. I premixed a number of my colors so I could work really fast. I didn’t want to spend time mixing color as I needed to paint quickly in the dimming light. The mosquitos and ticks were horrid. There were tons of them. Two minutes into painting a tick jumped on my ankle. I grabbed him, threw him toward the water and continued painting. Something happened to the mosquitoes shortly after that. They all disappeared. Not one even stayed behind. Also the ticks disappeared. I was delighted! A few gnats dove into my wet painting but didn’t touch me. I didn’t have any bug repellant. I’m going to restock the car studio with a big stash of it for the summer painting season. The river bank was very steep where I was standing. I couldn’t step back to see my painting. I’d have to stop painting, look carefully at the ground, and then walk back along the guard rail to get a distance away from the easel. I always have to step back periodically to see if my painting is working. I loved the mood of the greens as the sun dropped lower in the sky. The flat water lily leaves reflected the slight blue light of the sky overhead. The sky at this time of the evening became many shades of yellow, green and blue. At 8:00 PM I called it a wrap. I packed my gear and headed home. I have enough information to finish this painting back in my studio! Next post: Read it on the streets of NYC ! Hi there Mary!… This was my first visit to your intriguing and beautiful plein air gallery! I found you through my friend Todd Bonita’s site! I loved your Maine “postcards”… and your personal “play-by-play” that accompanied your adventures! I love the vitality and rigour of your brushwork… and your variety of subject matter! Seems we all share a magnificent passion… er obsession with being outdoors… even with all the tests. 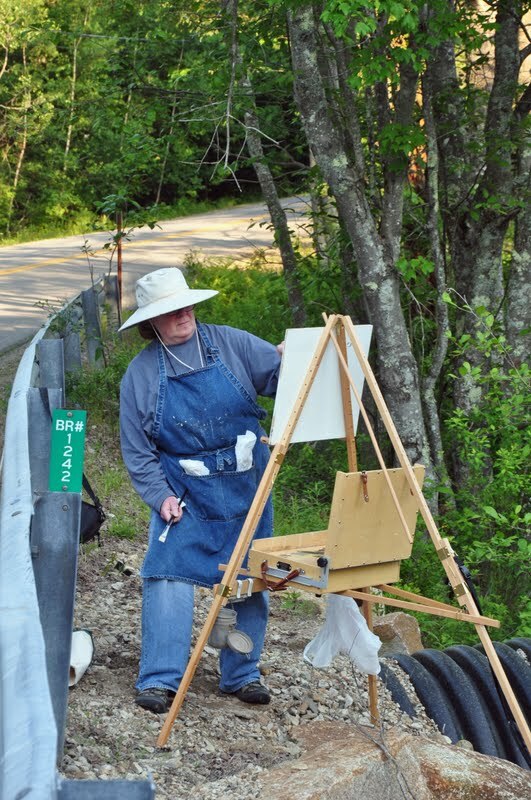 There’s nothing sweeter… more invigourating… and truthful than the plein air experience! Thanks for sharing your part of the world! I’m aboard!